Received this message last week from Boston. Lots to work with, including a picture, career, cultural heritage, family. Can you help him name his really nice boat??? Please add comments below. 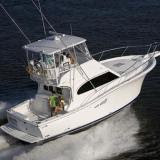 Bought '09 luhrs convertibel 35' w/Zeus pod drive. Have wife Claudia and two daughters - Siena and Carina. We have long family history in Italy - I am first generation Itlo-American, have spent a lot of time in Italy. My home town in Italy is Fontana Liri - have spent time on the Amalfi Coast. I work in the investment business. We live up currently in the Boston, MA area. I like sports and am a classic type A personality. "Sie Car" as in "Sea Car"
Ummm... what about your wife's interests/job? Is this YOUR boat or a family boat? Is she Italian too? Dolce Vita is predictable but lovely.